Beat the Austin area heat with window tinting. For your car, home or business the benefits of GraphicsGuys window tinting are wide-ranging. Blocks UV. Window film can block 99% of the sun’s ultraviolet rays reducing glare while protecting skin and eyes. Texas window tinting can make a car up to 60% cooler in the summertime. In a commercial or home setting window film helps rooms to stay cooler in the summer and warmer in the winter. Tinting also helps protect interiors and furnishings from fading and discoloration. Promotes security. Film also helps hold glass together if a window breaks from an accident or a break-in. 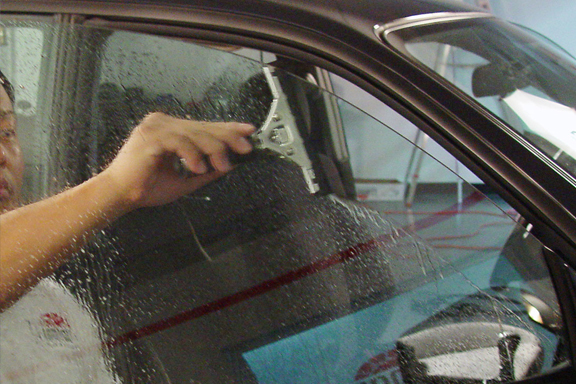 When installed on a vehicle, window tint makes it more difficult to see valuables in the car. You can increase overall privacy by selecting films that promote security. Reduces costs. High quality commercial and residential window tinting reduces heat gain by 80% helping to reduce utility cooling costs. Auto window tinting can make your car up to 60% cooler during the summer. GraphicsGuys tinting also helps maintain the value of your home and car. GraphicsGuys uses Llumar. For nearly 60 years, the world’s largest manufacturer of window film has helped protect cars, homes and buildings from the effects of the sun. If you’re looking for true color, optimal durability, and optical clarity Llumar is the product for you. If you’re looking for high quality window tint installation, call GraphicsGuys today.